Normally, I don’t try new restaurants too quickly, but I wasn't worried about visiting some place new in the Chase Park Plaza. The Preston has a spacious dining area and an open kitchen with high ceilings, including a private room holding rows of wine racks, all very elegant. More importantly, the one thing I heard about it was the serious cocktail program. I was not disappointed. I easily found something sweet for me and Linda was able to order her favorite flavor of whiskey. Below is the “Dear Katie” (doesn’t she sound sweet? 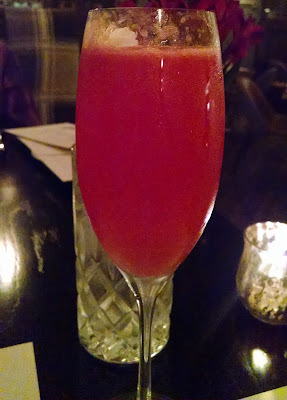 ), which blends Spiced Apple and Pomegrante Tea with Nolet’s Gin, Lemon, Flamingo Elixir, and Carra Prosecco. Things did get a little strange when we attempted to order from the main menu. 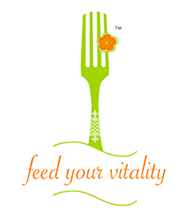 Dishes are not separated into sections by course type, which encourages trying a variety of items. Yet, the order of the items seem to be smaller to more fuller entree, and our server explained that the a la carte menu was more typical of European dining and the portions are smaller. You could easily just make a meal of starters. While not everyone at my table was too happy that there wasn’t side dishes automatically included, this worked out to be the perfect amount of food. I picked a type of salad and an entrée, which allowed us to save room for dessert! Of course I started with a salad with cheese! The Warm Baby Kale salad came with Butternut Squash, Taleggio, Pickled Shallots in a Miso Vinaigrette. 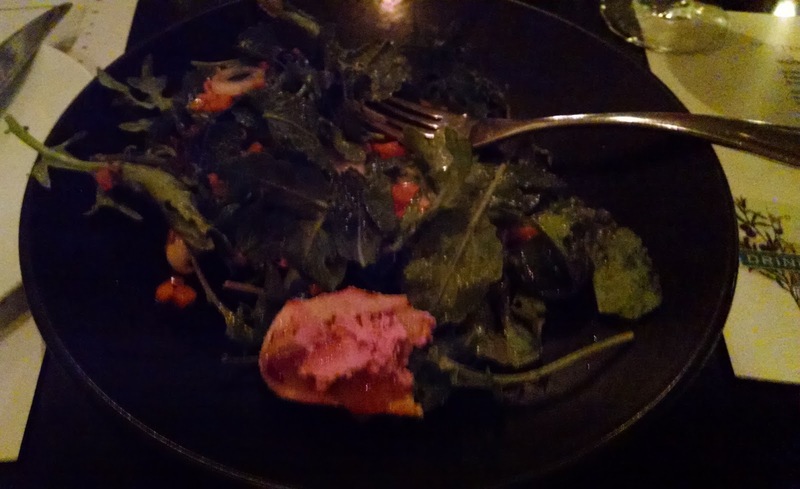 Linda got her favorite, an Heirloom Beet Salad, while my Dad was a little more daring by ordering the Chicken Liver Mousse. 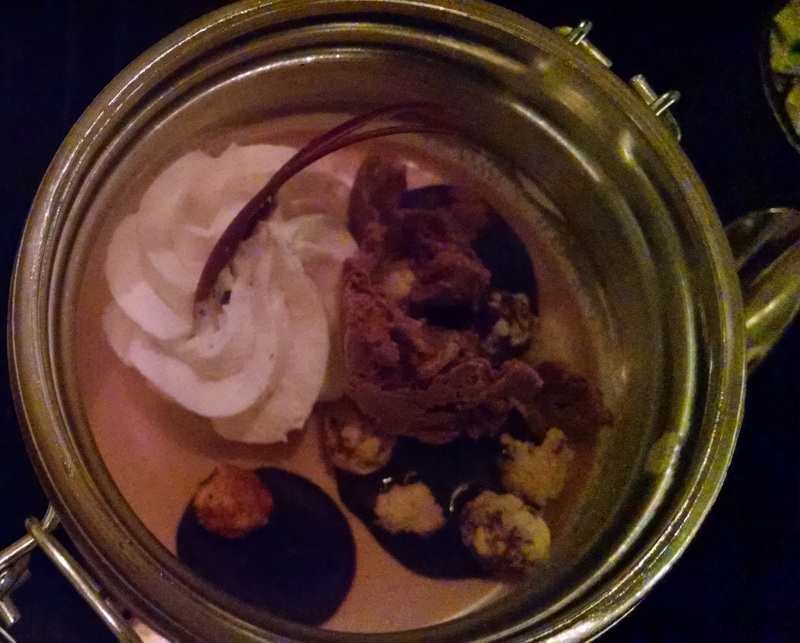 This mousse was amazing and was definitely the winner. You could easily skip the crostinis and spoon it right in your mouth. There were plenty of fish options on the menu, although we didn’t quite realize it due to their fancy Italian-sounding names. 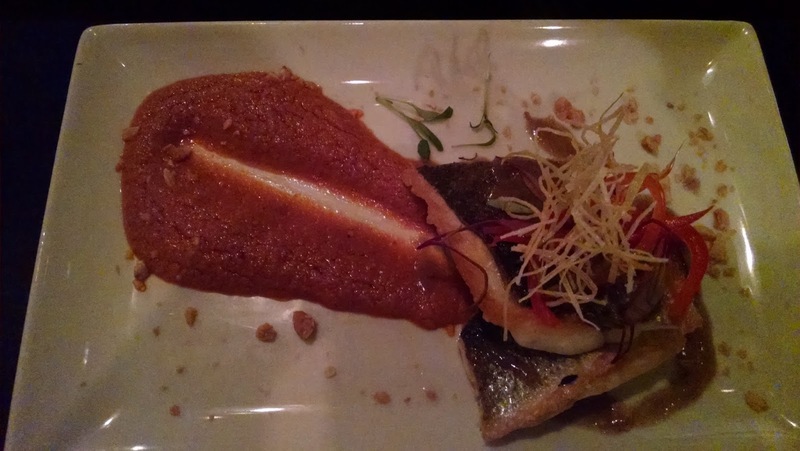 I ordered the Bronzino, while Linda tried the Barramundi. Both were delicious white fish smothered in a sauce. So French! The Bronzino, actually a European seabass, was pan roasted with Ancho Romesco, Marcona Almonds, in a Charred Leek Vinaigrette. 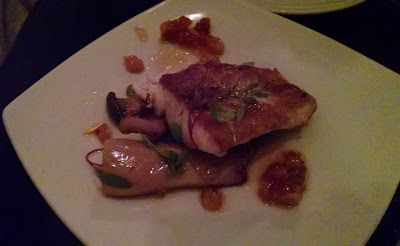 The Barramundi, an Asian seabass, was a little heavier with Royal Trumpet Mushrooms in a Hazelnut Vinaigrette. My Dad got the manly sounding Bone-In Short Rib and they were quickly devoured. The Preston serves a few meaty dishes such as a Grilled Lamb T-Bone and a NY Strip, as well as a couple of more interesting dishes such as the Charred Octopus and a Smoked Duck Breast. Something for everyone! The best show of the night, though, was dessert. We ordered a Milk Chocolate Panna Cotta to share, which was a Ferrero Rocher Gelato and Hazelnut injected with smoke. I really wanted to lick the insides completely. 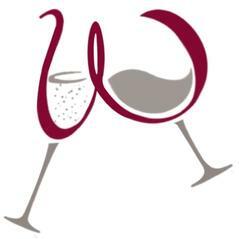 Need a new place to go for a special occasion? Want a fancy cocktail? This is your place.